Our company was founded on the principle of doing things the right way. When it comes to basement waterproofing, that means that we excavate along the foundation and install premium waterproofing products. Situations will be diagnosed individually and recommendations will be made accordingly. If we can clear out gutters and downspouts to reduce basement seepage, that's what we will do. We don't believe in high pressure sales tactics or pushing a same-day contract to be signed. We rely on referrals from our friends and neighbors to keep us busy. 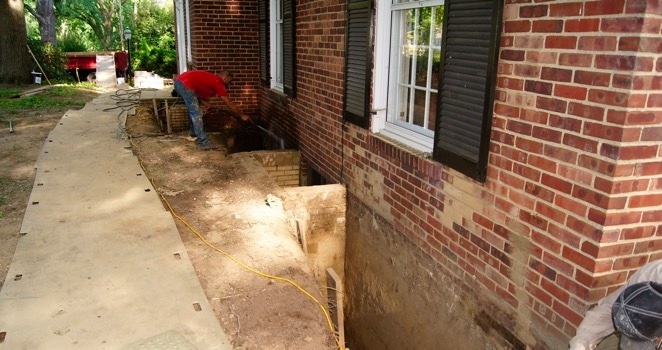 If we determine from a perimeter and basement inspection that excavation is required, our crew will take detailed notes and drawings to put together a quote. We want our customers to take the time to make a well thought out decision even if that means getting multiple quotes. 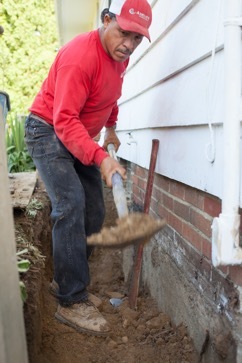 By performing the work from the exterior wall of the basement or crawlspace foundation, we are restoring and protecting the foundation. Outlined below is an overview of our process. The process starts by removing any landscaping around the exterior perimeter of your home. We will also carefully remove and maintain your existing topsoil for reuse at the end of the project. Next, we excavate the soil down to the footers, load it into dump trucks, and haul it away. At this time, we will also remove any existing downspouts below the ground as well as remove your footer drains (drain tile). Once the area is cleared out, we will wash down the foundation, repair any cracks with hydraulic cement, and apply a thin coat of cement parging over any unprotected areas. After the cement has dried completely, we will roll on an elastomeric waterproofing membrane. This process will replace the foundation tar that was probably installed when your home was originally built. Elastomeric coatings are thicker, last longer, and have a flexible quality that allows it to stretch and bridge over minor cracks should the foundation shift again in the future. When the membrane application is finished, we will install PVC drain pipes starting with a 4" perforated pipe at the deepest part of the trench. Cleanouts are installed so that the system can be inspected and maintained in the future. We then install additional 4" (non-perforated) PVC pipes for downspout drains. Once the pipes are approved by the city building department, we will backfill the trench with #57 washed gravel to 18" below ground level. The saved top soil is then reinstalled and your project installation is complete. All sewer pipes should be maintained to clear out roots, leaves, or debris that may have found its way into the system. Cleaning an inspecting the pipe can extend the life of the piping around the foundation and reduce the chances of sewer backup and seepage into the basement. If you have any additional questions about our process or you want to setup a free estimate, please call us at (440) 943-2233 or fill out our contact form.